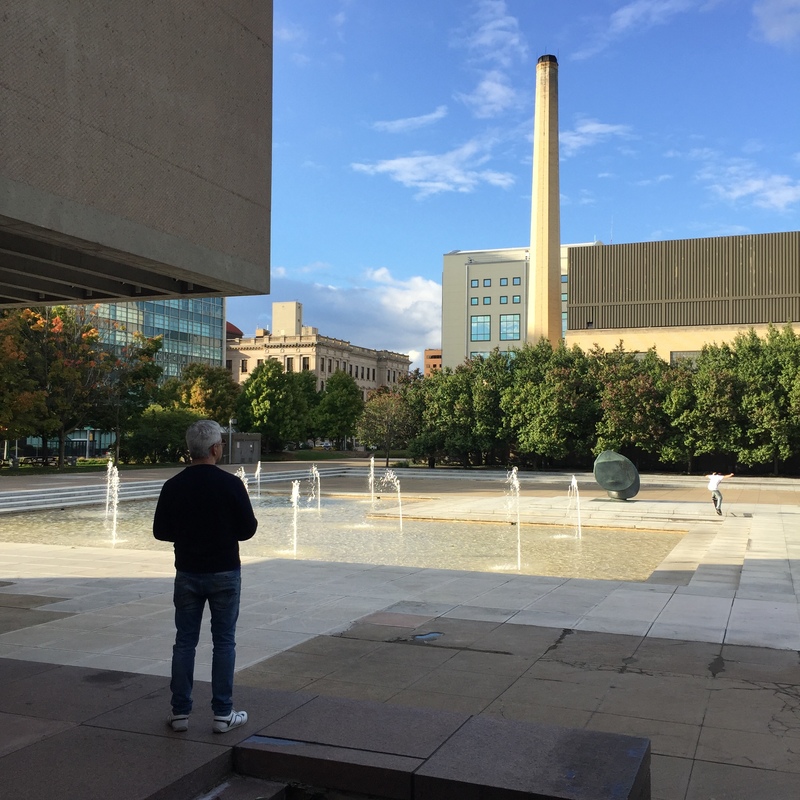 Howard Rideout | Howard Rideout Architect Inc.
On a recent road trip to Boston, I chose to follow the route of the Erie Canal and visit the various cities that line it. What had been originally planned as a tour of specific Art Deco buildings in those cities, became something quite different. I had experienced first hand the changes that globalism have inflicted on a small town economy while working in Midland, Ontario designing the Midland Cultural Centre but heading back from Boston I was able to see these same phenomenon working its way through America’s heartland. Toronto and Boston are “it” cities, capturing the popular imagination, and in many ways “on the radar” within the global economic arena. Urban studies theorist, Richard Florida chronicles the “Creative Class” and the cohort that has achieved success in engaging the world economy within these global cites but it is the medium-sized cities, these “flyover places” that line the Erie Canal in upstate New York that represent the contemporary reality of much of American urban life. It is in places like Albany, Syracuse, Rochester and Buffalo where much of the North American population resides and where special attention is required if these places are going to integrate into the economic systems of the future. 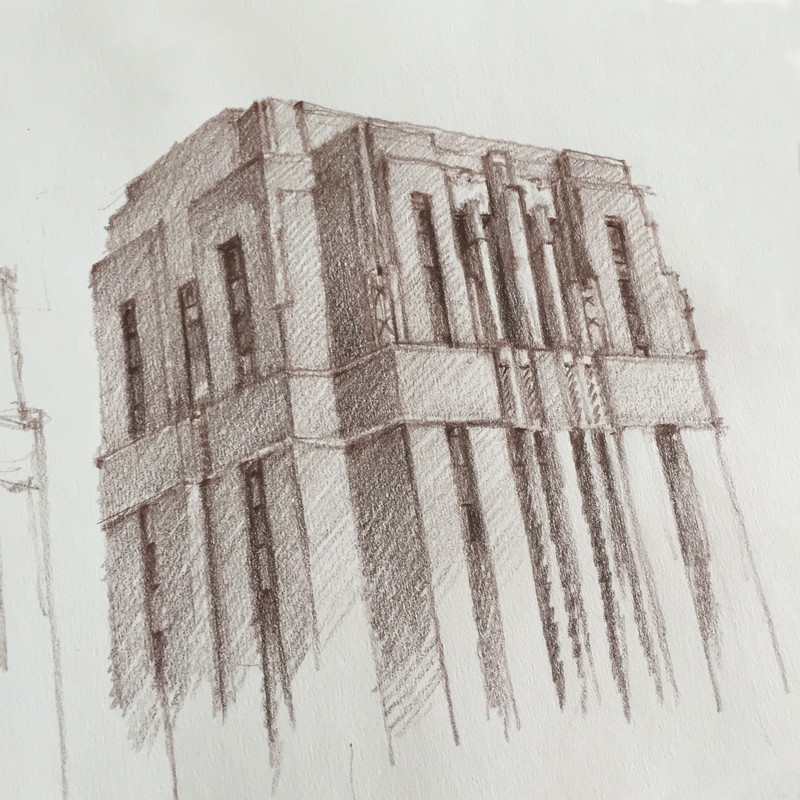 My initial itinerary had been filled with a list of Art Deco buildings that I had been fascinated with over the last couple of years. These buildings represent one of the last great eras of prosperity within these smaller centers. These places have never really recovered from the hollowing out of their retail cores in The Great Depression and later with the flight of its citizens to the greener pastures (literally) of suburbia in the decades since. Many of civic leaders of these cities have attempted to address this exodus by linking these two worlds with a string of highways. They however, only exacerbated the situation, resulting in a discontinuous urban fabric that left the few remaining retail shops stranded in a sea of asphalt. What’s left of the cores of these cities is a landscape first devoured by mid-century highway engineering and then the erasure of the “unofficial city.” Unlike Toronto and Boston which have retained large parts of their storefront retail strips in the “sloppy urbanism“of their historic streets, many of these centers along the Erie Canal have lost this vital urban ingredient. Jane Jacobs writes in Death and Life of Great American Cities that it’s within these buildings that incubator businesses can start, and this built form that is now almost completely erased from many of these cities. The resulting urban landscape, once this informal urbanism is demolished, resembles a university campus and not a vibrant core, with architectural gems surrounded by gardens and parking lots. Only the architectural monuments remain and the hope by their civic leaders that their urban economies would eventually turn the corner and regain their vibrancy. Instead their cores are a testimony to 70 years of disinvestment as the public realm has moved from the streets of their formally vibrant downtown areas, to the interiors and backyards of sprawling McMansions. 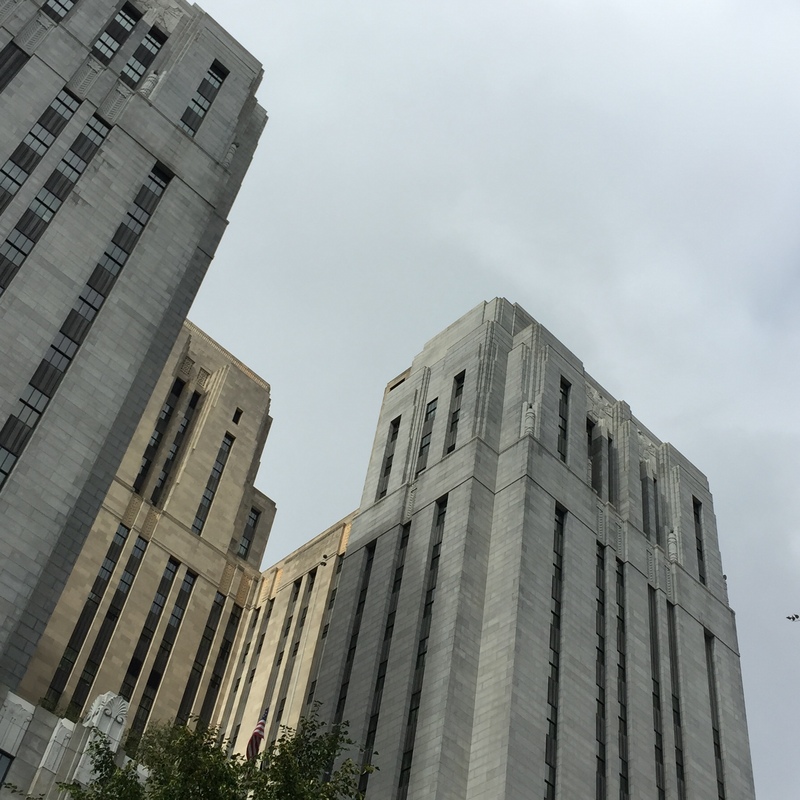 Albany, our first stop on our way back from Boston, represents the height of this phenomenon with buildings of national caliber floating in a barely functioning urban core. 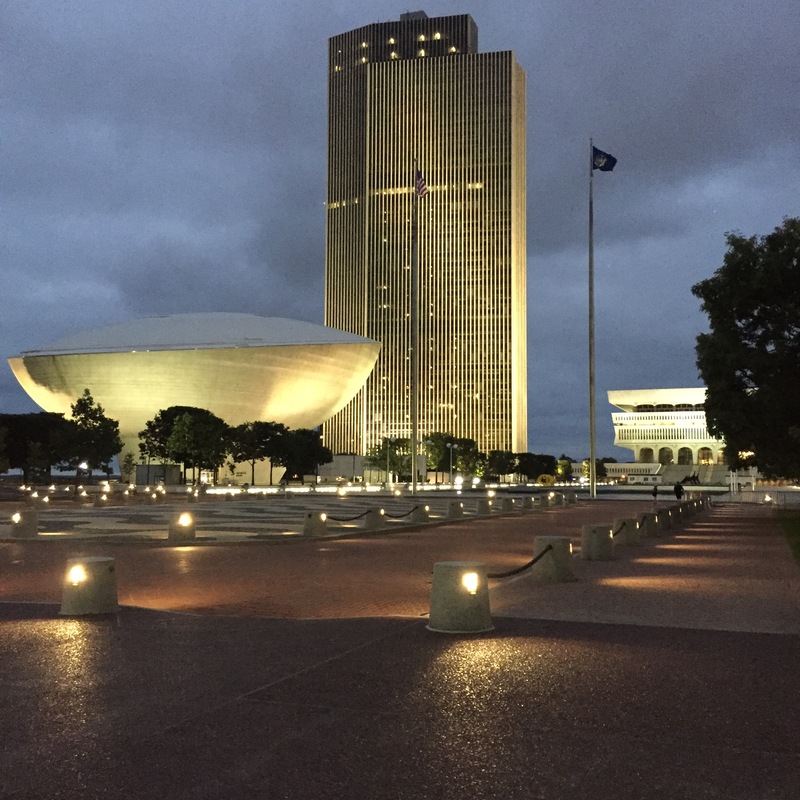 The construction of the buildings of the Empire State Plaza in the 1970’s resulted in the leveling of 40 city blocks of 18th and 19th century urban fabric. 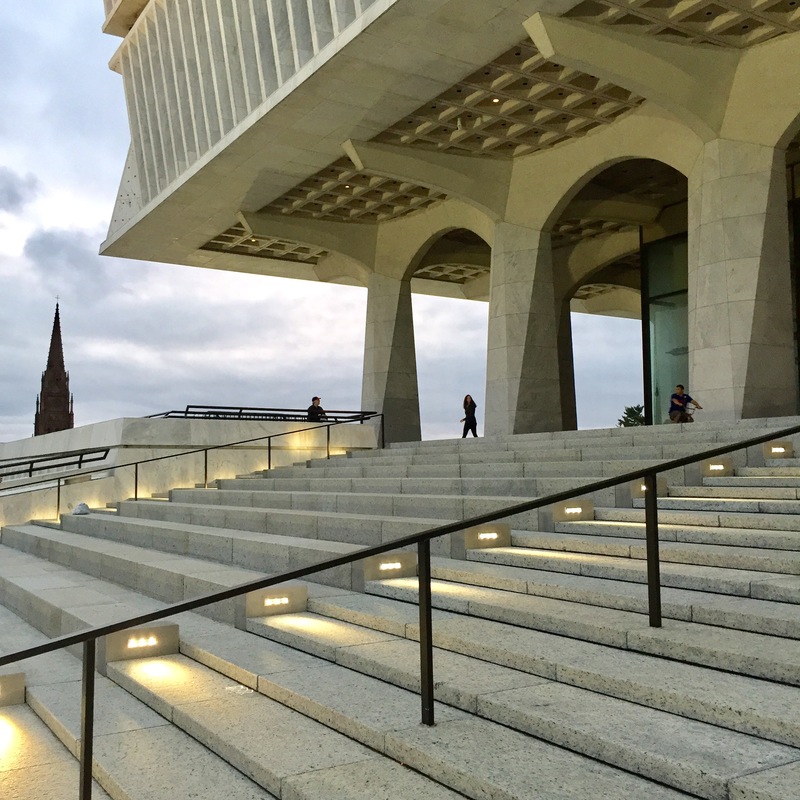 Architectural critic Martin Filler in In The Making of Empire State Plaza, says “There is no relationship at all between buildings and site, neither at grade nor atop the podium, since all vestiges of the existing site have been so totally obliterated. Thus, as one stands on the Plaza itself, there is an eerie feeling of detachment. The Mall buildings loom menacingly, like aliens from another galaxy set down on this marble landing strip”. These areas of the city which could have accommodated an urban renaissance, now underway in the much smaller city of Troy, only 15km upstream, have been erased. The monuments that replaced this dense community of complexity and informality are anything but. 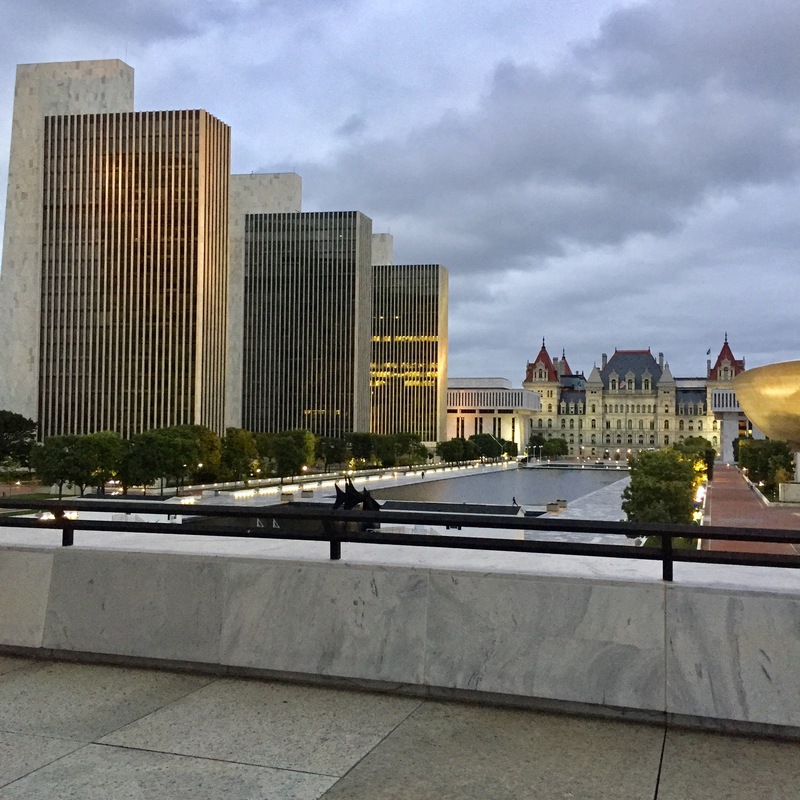 The huge, more than 400 m long plaza and reflecting pool is surrounded by the grandiose urban monuments of modern as well as historical pedigree, which befit their role as the government center of New York State, but the ensemble is devoid of life. While impressed with the heroic scale of the design I was forced to look elsewhere for any sign of night life. After an exhaustive search I found a small neighbourhood in the remaining area of the urban core spared from the wrecking ball. 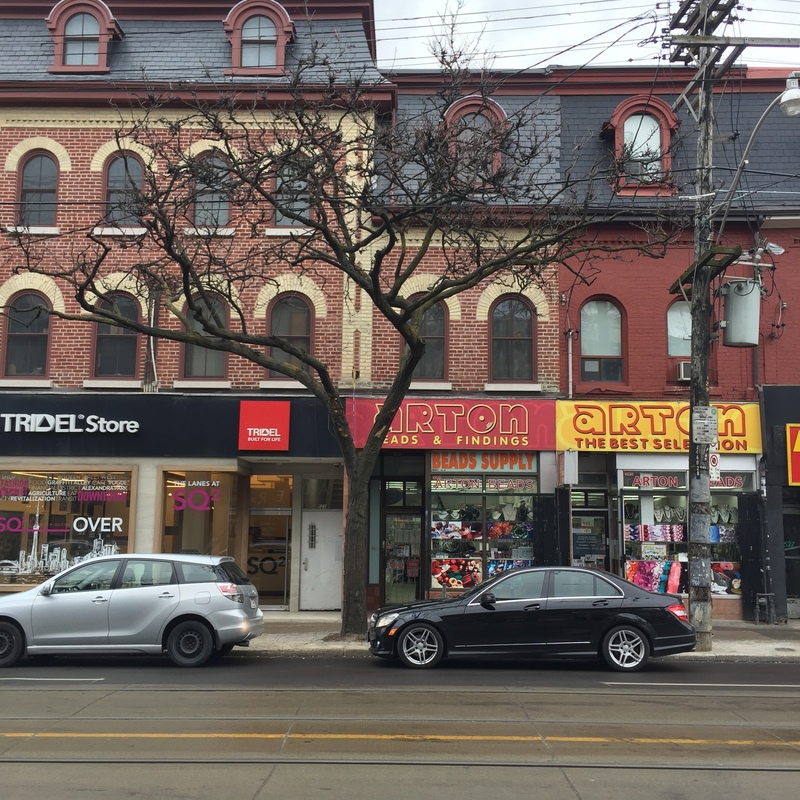 It was here in these two and three-storey buildings that trendy restaurant operators had begun to transform this otherwise underutilized historic retail fabric. With very few of these smaller shops remaining and even fewer groupings of these buildings lining the streets in continuous rows of storefronts, it looks like Troy with its intact downtown built form, will become the new commercial core of the region. When seen in comparison to the intact retail strips of Toronto or Boston, or in the smaller places like Troy, many mid-sized cities like Albany have limited their ability to rejuvenate their cores with the loss of this essential urban ingredient. 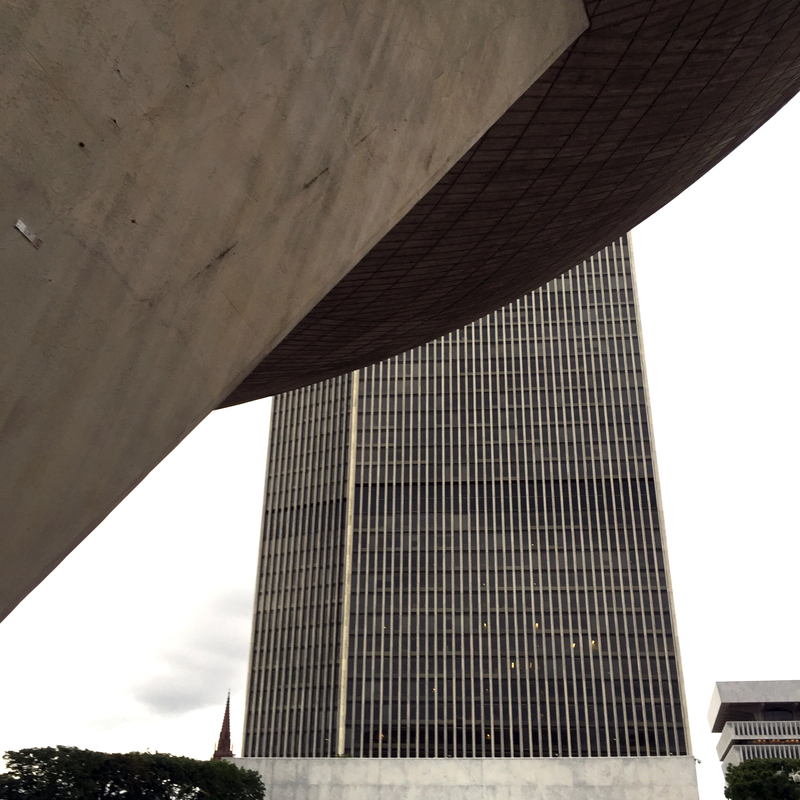 In Syracuse – my next stop along the Erie Canal, there wasn’t the grandiosity of built form that I had seen in Albany. Here the downtown was filled with exquisitely detailed buildings representing almost every decade. Of all the great architecture, two monumental buildings stood out to me. 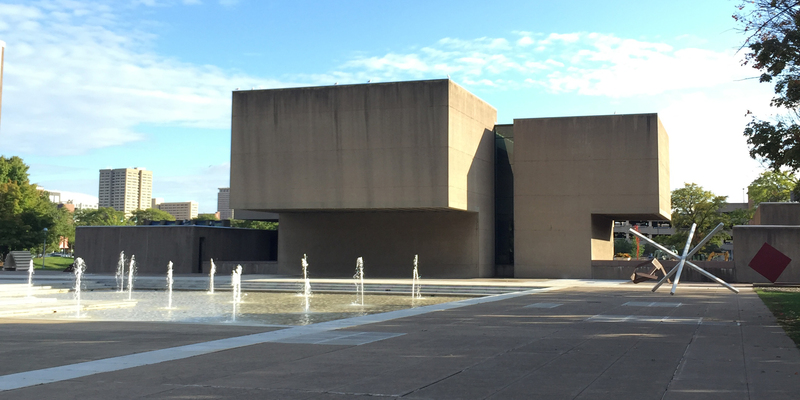 The Everson Museum of Art is a Brutalist expression of “architecture as sculpture”, designed by I. M. Pei in 1964. 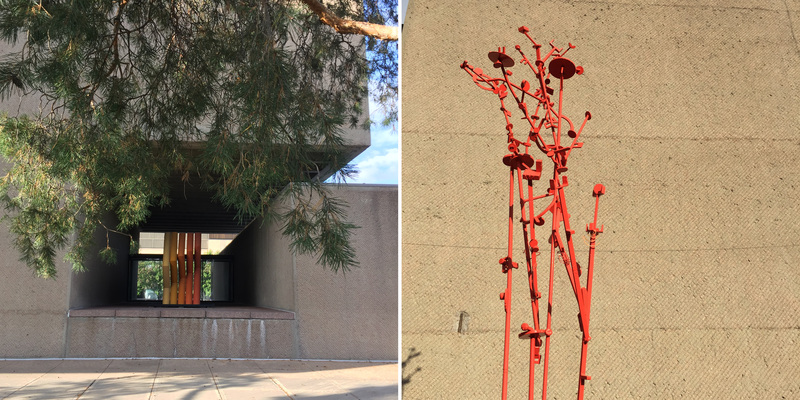 After more than a half century since its construction, the building is surrounded by a sea of parking lots with a collection of equally anti-urban show pieces surrounding it. The large open space adjacent to the gallery gave the building an appropriate plinth to allow one to enjoy the simplicity of its hulking cantilevered forms but with it sitting in a sea of open spaces around it the site, it seems empty and foreboding. 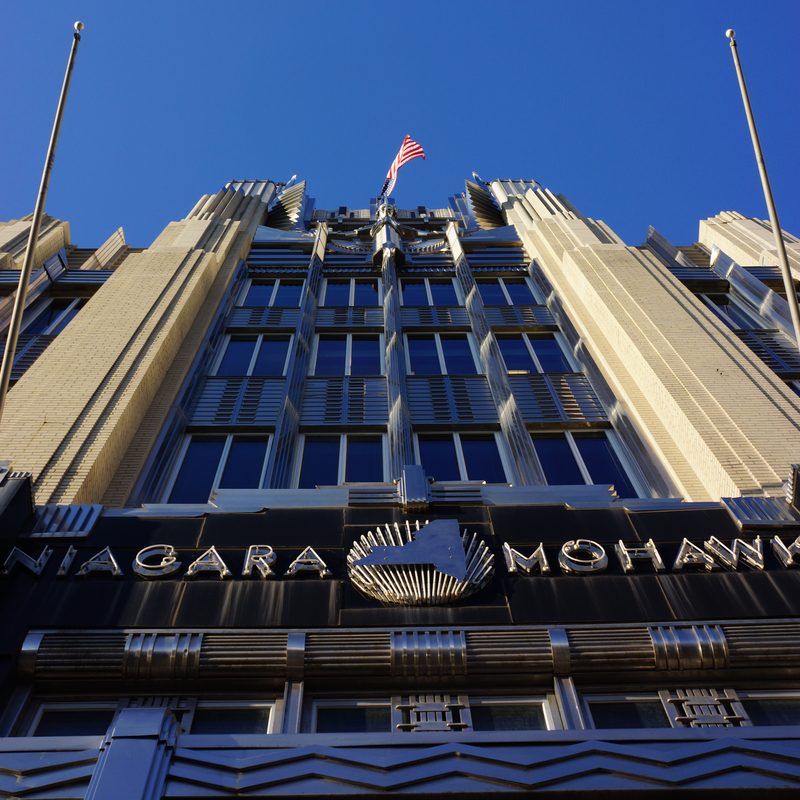 At the other end of the downtown past many wonderful architectural monuments, many of which sit abandoned or underused, I had to stop in awe at the Niagara Mohawk Building. 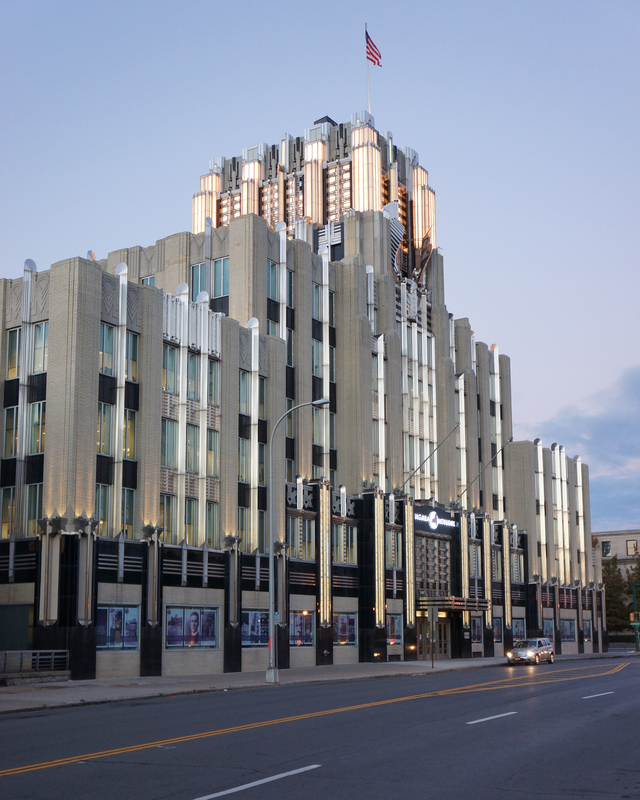 This Art Deco extravaganza was built in 1932 to announce to western New York the power player in the region. This building could not have been more exuberant. 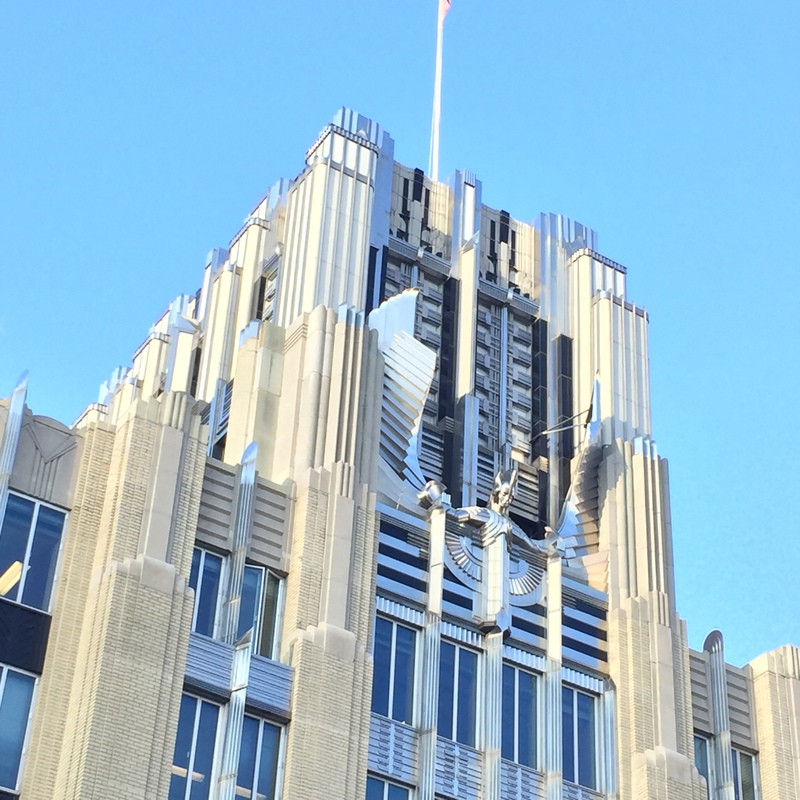 It was more urban and fun than even the most extravagant Art Deco building I have seen in New York City. After I arrived back in Toronto I researched historic photos of the building to understand the urban context of the building after it had been constructed. At that time the ground floor facade accommodated storefront retail and was animated with canopies and shop doors and window displays. This scene has been replaced with opaque store fronts filled with movie posters and it reveals the contemporary urban condition for this monument which is now stranded in a maze of highway exit and entry ramps, with people rushing quickly into and out of the hollowed out core. Rochester presented a similar situation with a rich legacy of architectural heritage throughout the historic centre. 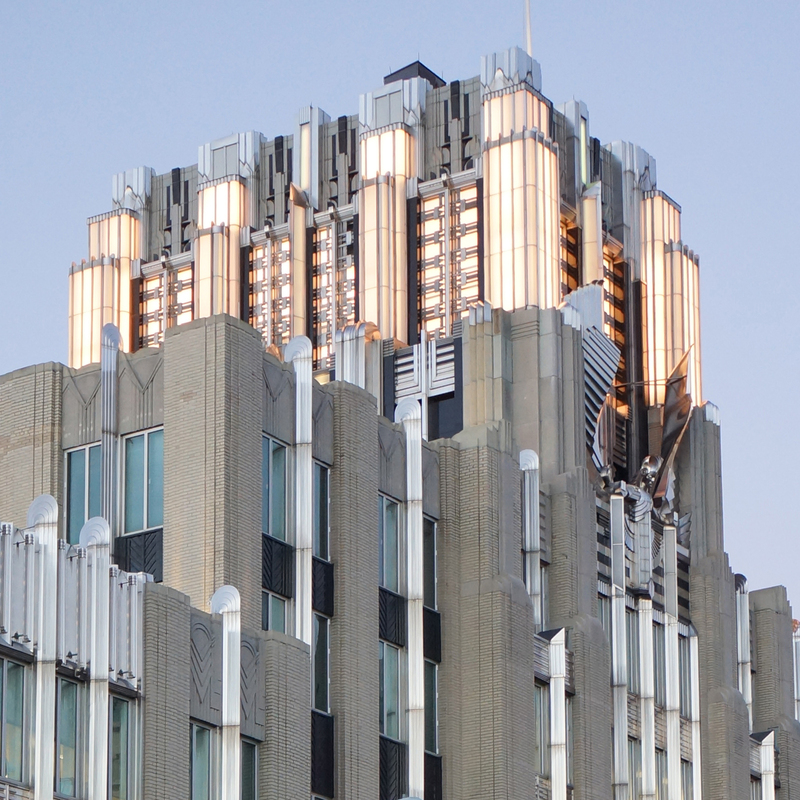 Here the building that caught my eye was the Times Square Building – a monolithic Art Deco delight. Solid and grounded, reaching up like a great hydro dam into the sky. At its summit a fantastic finale that again rivaled anything I had seen in New York. In addition to its cityscape being adversely affected by highway engineering, the loss of Kodak has been a huge blow to Rochester, which owed much of its success to this one company. 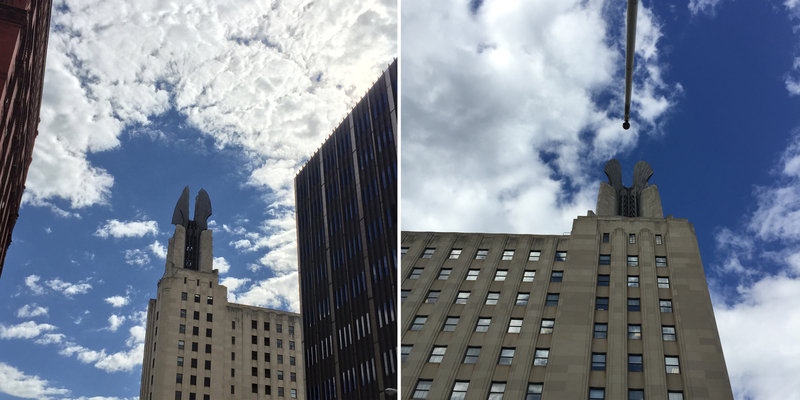 The last stop on the trip back to Toronto was the city of Buffalo with its great hulking Art Deco City Hall. Here again the scale and flamboyance of this building speaks of the optimism that permeated the Erie Canal cities at the beginning of the 20th century. Buffalo is a city, like many of its neighbors along the Erie Canal, that has lost much of its retail fabric, in and around its downtown core. 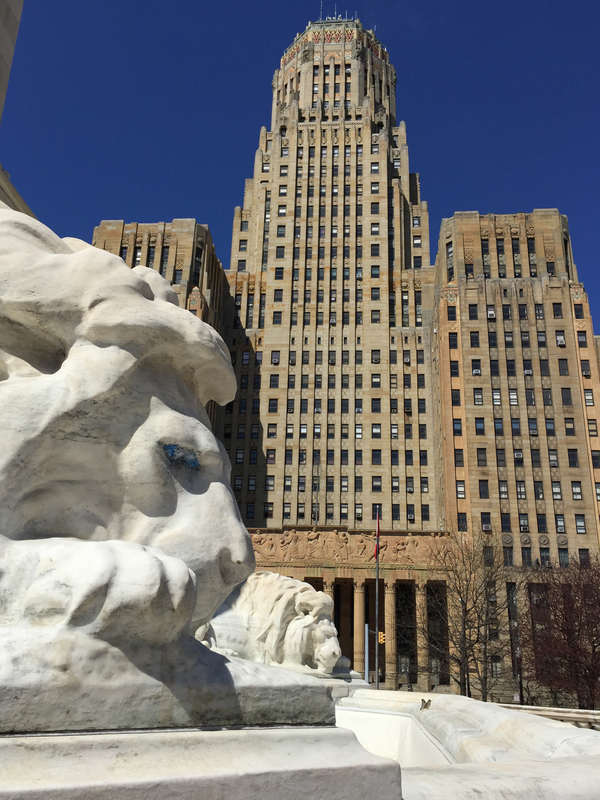 However, unlike these other cities, Buffalo’s citizens have begun to reinvest seriously in its urban neighborhoods. While much of the typical urban fabric is in disarray, its low-density garden city communities at the edge of downtown are showing signs of significant gentrification. Frederick Law Olmsted (1822–1903), the greatest landscape architect at the turn of the century had laid out his influential master planned design for the City of Buffalo in the 1860’s shortly after his designs for Central Park in New York. This plan for the city was more elaborate and extensive than had been seen in any other American city since the master planning of Washington. His design brought grand avenues and wide tree lined boulevards into the cities form early in its evolution and it is these areas of the city that have retained much of their historic architecture and retail fabric. While each city on my tour back from Boston is finding its own way forward, these nodes along the Erie Canal are a physical manifestation of the economic forces that have shaped their existence. 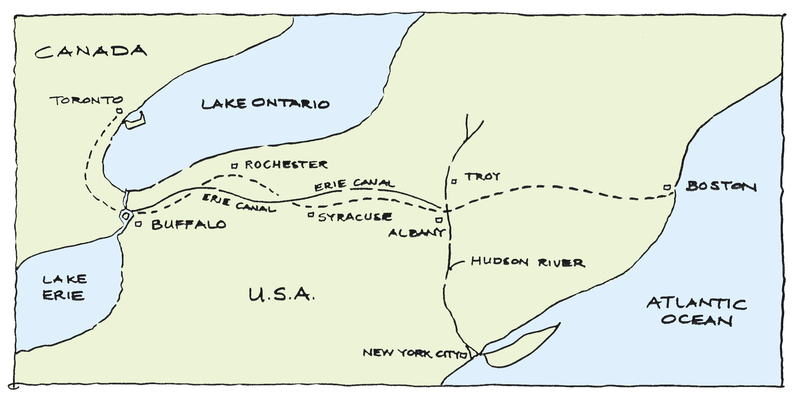 The boom created by the opening of the Erie Canal, which linked these inland cities to the world, was proceeded by a steady decline as technology evolved and made the canal obsolete. One of the last great waves of prosperity for the region can be seen by the exuberance of the Art Deco architecture of these cities. 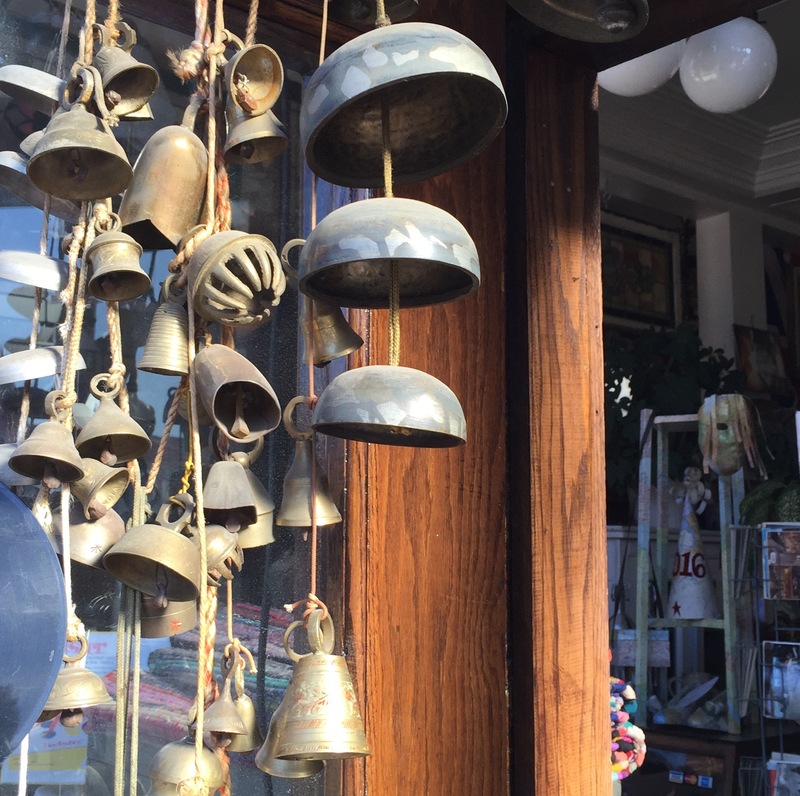 With a new interest in living in historic neighborhoods seen throughout North America, my hope is that the civic leaders of these cities will understand the importance of retaining what little street front retail buildings that they have left. These older streetscapes can accommodate the new businesses of the future. Yes, garages in suburbia can also provide incubator spaces for small start-ups but they are not suited for every type of business. Some of these new ventures require the public exposure that an urban street-front shop provides. Monuments are beautiful but not terribly good at providing a place to enjoy the fine grained city life we are again craving.